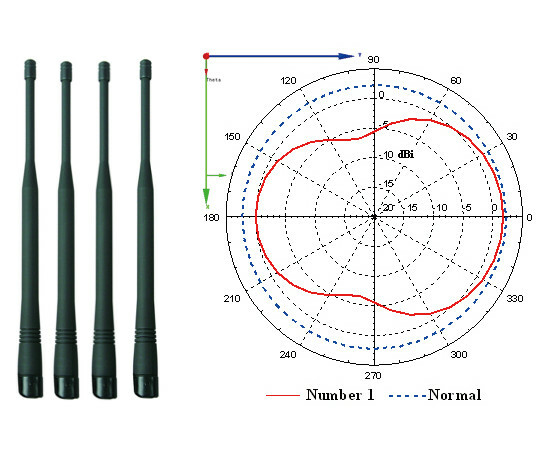 Antenna installation is the most important factor affecting the transmission distance and signal quality of wireless microphone systems. Therefore, for multi-channel wireless microphone systems, it is necessary to know how to effectively simplify the large number of antennas to obtain efficient and stable reception quality as well as savings on installation costs. From Figure 2, we can see the variation of the antenna receiving pattern and efficiency. The horizontal radiation pattern of antenna 1 presents a very uneven distribution, and the overall antenna efficiency decreases greatly to 42%! This setup method may result in different receiving signal strengths for each channel, and may affect the signal stability. This method would be the most simple and economical installation for short-distance reception that does not demand efficiency. Figure 2: Horizontal radiation pattern of antenna 1. To avoid “The proximity effect of multi-antenna” caused by the antennas directly installed to the stacked up receivers, you can use an external or built-in daisy-chain antenna divider to share one pair of antennas, and simplify the system installation. As shown in Figure 3, the input signal of the antenna connected to the MIPRO AD-12 is divided into two signal outputs and these two outputs directly connect to the receiver’s antenna inputs. This setup method is used for two receivers being stacked up. However, although the 1-to-2 passive antenna divider simplifies the installation of antennas and avoids the “The proximity effect of multi-antenna”, the cascaded divider would weaken the receiving signal strength, increase the noise figure and decrease the sensitivity. Thus, the number of cascaded dividers must be as few as possible. In order to solve the problem about the signal attenuation caused by the cascaded passive antenna dividers, a booster must be added to the divider to make it an active divider, so as to compensate for the signal attenuation. Figure 4 shows a 1-to-8 active “daisy-chain” antenna divider. Ideally, the active daisy-chain antenna divider with a booster can compensate for signal attenuation. However, in a cascade of multiple receiver antenna systems, the noise figure of the divider will cause deterioration of the sensitivity. As shown in Figure 5, assuming the noise figure of an active daisy-chain antenna divider is 5dB, the gain is 0dB, and the noise figure of the receiver is 7dB. If there are eight dividers cascaded, the system noise figure of the eighth receiver will become 13dB, that is, the noise figure is 6dB worse than the first one. 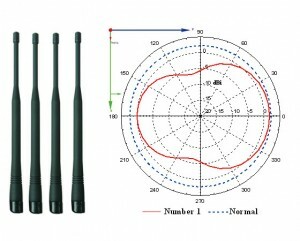 To avoid the disadvantages of the daisy-chain antenna divider, and to simplify the antenna installation by sharing a pair of antennas, the best method is to use the “parallel” antenna divider. 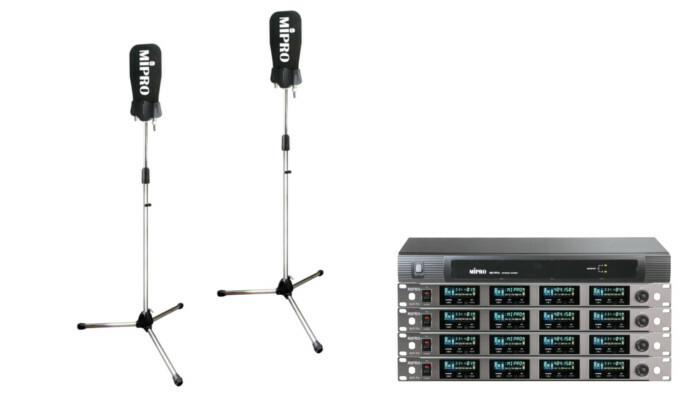 As shown in Figure 6, the MIPRO AD-707a is an active parallel antenna divider. It has 1-to-4 outputs with a booster circuit to compensate for the signal loss, also an active output for connecting to another divider input port, so as to meet the needs of more than four receivers. Figure 6: One AD-707a active parallel divider connected to four receivers; can be cascaded to another divider. For installations with eight receivers, assuming the noise figure of an active parallel antenna divider is 5dB, the gain is 0dB, and the noise figure of the receiver is 7dB. The noise figure is estimated as shown in Figure 7A, the noise figure of the system is 8.6dB (Receiver 1~4) and 9.7dB (Receiver 5~8). Compared to the noise figure of the original receiver, the differential can be controlled within 3dB. Under the same conditions, the active daisy-chain antenna divider can connect only up to three receivers, as shown in Figure 7B. Figure 7B: For the same noise figure in active daisy-chain antenna divider system, only three receivers can be cascaded. 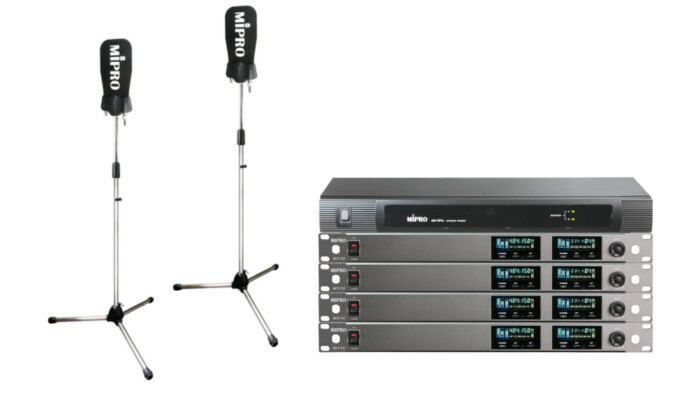 MIPRO’s multi channel antenna receiver system is the best solution. Some brands design their receivers with a built-in active daisy-chain antenna divider to simplify the antennas installation. In fact, the sensitivity of the receiver would decrease as the number of cascaded units are added. 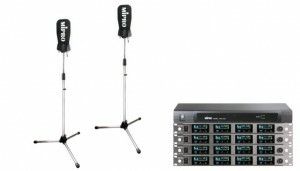 The MIPRO receiver with a built-in or external active “parallel” divider is designed to completely solve the above disadvantages. Studying the following cases will help you understand further. If you choose other brands, you must stack up two dual-channel receivers, and the sensitivity will decrease more than 1.6dB, as shown in Figure 8A. If you choose a MIPRO ACT-74 or ACT-747 quad-channel receiver, only one pair of antennas is required as both of these receivers have a built-in premium quality active parallel divider with an ultra-low noise figure and high dynamic input characteristics. Without any cascade, the quad-channel receiver provides maximum sensitivity. 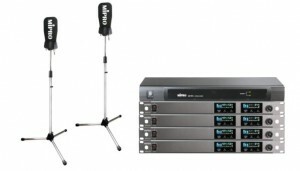 This is the simplest, most effective and cost-saving professional multi-channel system, as shown in Figure 8B. If you choose other brands, you must stack up four dual-channel receivers and connect the antenna input and output of each receiver in order to share one pair of antennas. The result is the sensitivity will decrease more than 3.6dB, as shown in Figure 9A. 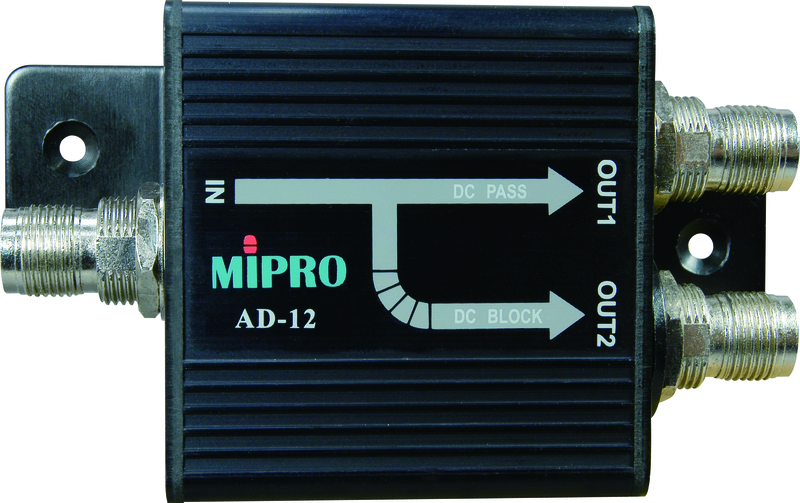 Four MIPRO ACT-72 or ACT-727 dual-channel receivers, as shown in Figure 9B, or two MIPRO ACT-74 or ACT-747 quad-channel receivers, as shown in Figure 9C, require only one AD-707a wideband antenna divider to share a pair of antennas. Due to the low noise figure of the divider, the receiving sensitivity has almost no attenuation. If you choose other brands, you must stack up eight dual-channel receivers and connect the antenna input and output of each receiver in order to share one pair of antennas. The result is the sensitivity will decrease more than 6dB (cable loss is not included), as shown in Figure 10A. 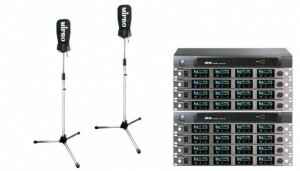 If you choose four MIPRO ACT-74 or ACT-747 quad-channel receivers, only one AD-707a wideband antenna divider is required to share a pair of antennas. As shown in Figure 10B. It is not recommended to choose dual-channel receivers with built-in active daisy-chain divider of other brands for such large installations. Use eight MIPRO ACT-74 or ACT-747 quad-channel receivers and two AD-707a wideband antenna dividers (one AD-707 for four receivers) to share a pair of antennas, as shown in Figure 11. The result is the sensitivity of each receiver is averaged and attenuation is limited to within 3dB. Using the antenna divider in the antenna installation for multi-channel receivers not only reduces the number of receiving antennas but also simplifies the installation. Most important of all, the antenna short-distance coupling effects can be avoided, maintaining the original antenna radiation pattern and reception efficiency. From the information in this article we know that regardless of the use of internal or external daisy-chain antenna dividers, the number of cascades should be as few as possible to avoid the sensitivity attenuation. Using the parallel antenna divider to avoid the shortcomings of the daisy-chain divider is the best solution for the multi-channel receiver antenna installation. The MIPRO AD-707a wideband antenna divider utilizes ultra-high dynamic, low noise active components and wideband microstrip circuit design, featuring ultra-low intermodulation distortion and signal loss. In parallel mode it provides four antenna diversity receivers to share a pair of antennas, which can eliminate spurious interference, and its output gain equals to 1. Without any external booster, it can keep the sensitivity of each receiver, and its daisy-chain output port allows more channels to be operated. 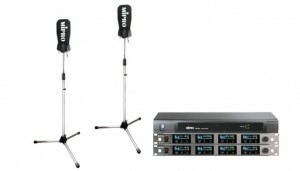 Moreover, the output connectors provide bias for an external booster, making it easy to connect a variety of MIPRO antenna systems for long-distance transmission. Each divider output port has individual characteristics and does not affect the others. To sum up, choosing the AD-707a for a multiple system antenna installation is the best solution.